In a quiet, short week for markets the S&P 500 hit new all-time highs and ended the week with gains of 1.01%. There were no clear drivers in equity markets last week, as every sector except energy and financials outperformed the index. Energy decreased by 2.12% as oil continues to decline on the back of the recent OPEC meeting, while financials have been somewhat of a political proxy since the election. Last week was very volatile on the political front, hence the decline in financials. Defensive sectors led the rally, with utilities notching a 1.65% gain on the week. The 10-year interest rate was down 9 basis points last week as rates sharply fell following the May jobs release on Friday. Nonfarm payrolls grew by just 138k and the two month revision was -66k. This brought the 3-month average down to 121k, which is over 60k jobs below its 12-month average. The report did not have much of an effect on short-term rates, with the 2-year ending Friday unchanged. 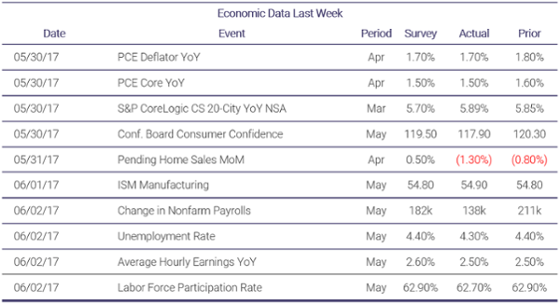 Rate hike probabilities for the Fed’s June 14 meeting actually increased after the jobs report to 92.7%, signifying that markets are starting to believe the economy is at full employment. The euro continued its recent strength versus the dollar, increasing by 0.86% to 1.13 as US economic data was worse than expected. The yen was also stronger versus the dollar for the same reasons, rising 0.84% to 110.40. Oil decreased yet again last week, falling by 4.30% to $47.66. With most analysts expecting continued inventory withdrawals in the near-term, markets have focused on OPEC and Russia’s outlook through 2018. The consensus is that OPEC’s current agreement will do little in aiding the market, as shale production has adapted to the new normal of $40-50 oil. Nevertheless, US inventories had another withdrawal this week, decreasing by 6.43mn barrels, while both production and rigs increased again. In a Bloomberg interview on Friday, Russia’s Economy Minister said, “We’re actually ready to live forever with the oil price at $40 or below. All macroeconomic policy is now based on the assumption of the oil price of $40.” This exemplifies why Russia has been virtually non-compliant with the OPEC agreement. The country can steal market share from competitors while having its competitors curtail supply to keep the price stable. With this week being relatively light on the economic data front, markets are likely to focus on the implications of a potential rate hike at the Fed meeting next week. The United Kingdom is holding its snap election on Thursday. Theresa May’s Conservative Party has seen its large polling lead shrink in the last few weeks, and recent polls show that it has just a 4% lead on Jeremy Corbyn’s Labour Party. PM May originally called for the election due to her large polling lead. With Brexit negotiations set to begin very soon, a loss for PM May at this stage could bring even more turmoil for the nation.